The Diomede Islands are two islands in the Bering Strait, about halfway between mainland Alaska and Siberia. 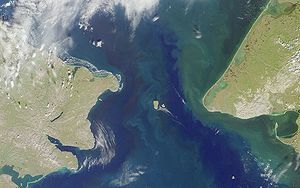 They're are also called Gvozdev Islands in Russian. 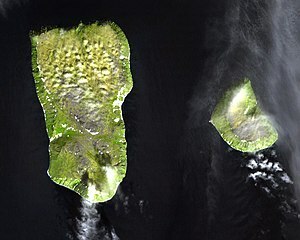 There are two islands, called Big Diomede. and Little Diomede respectively and such a island is of little size. Little Diomede is also known as Krusenstern Island, but there are also other places with this name. The Eskimos who live there call it Ignaluk. The other island, Big Diomede is also known as Imaqliq, Inaliq, Nunarbuk or Ratmanov Island. Big Diomede belongs to Siberia, Little Diomede is part of Alaska. They Chukchi Sea is to the north and the Bering Sea to the south of the islands. 9.3 mi (15.0 km) to the southeast is Fairway Rock, an islet which is usually not considered part of the Diomede Islands. The islands are separated by an international border and the International Date Line which is approximately 1 km (0.6 mi) from each island. At the closest distance between Little Diomede and Big Diomede, the two islands are only about 4 km (2.5 mi) apart. People who live on Little Diomede Island do so in a small village called Diomede, on the west side of the island. There are plans to build a connection between Siberia and Alaska, either as a bridge or a tunnel (Bering Strait bridge spanning the Bering Strait). In that case, the Diomede Island would be a halfway point, as they are about the middle of the Bering Strait. They are sometimes called Tomorrow Island (Big Diomede) and Yesterday Isle (Little Diomede) because the big island is 21 hours ahead of the small one (except when changing daylight saving time, done on different dates). The people who lived on Big Diomede Island were moved to mainland Russia by the Soviet government. A small Russian military base is currently on the island. Little Diomede has an Inupiat Eskimo population of 170, mostly in the City of Diomede. This village there has a school, and a local store. Some eskimos there are famous for their ivory carving. Mail is delivered by helicopter, weather permitting. ↑ "You CAN see Russia from here! ".